Over the past 20 years Britain has passed from a Strategic Defence Review, through Blair’s Wars and Brown’s Budgets to seeking to defend itself in a self-imposed age of austerity via the Strategic Defence and Security Review of Cameron’s crew. In the SDR of 1997/8 Britain committed itself to a well-reasoned and commensurate level of forces and to a strategy of expeditionary warfare (which Gordon Brown then refused to fund). The SDSR of 2010 was a hurried exercise, which led to the premature withdrawal from service of the Navy’s carriers and of the Harrier force, and the setting out of something known as Future Force 2020. Quality not quantity would be the watchword and, meanwhile, there would be some capability holidays – one of which was the loss of Britain’s long-range Maritime Patrol Aircraft (MPA). A 7.7 per cent cut in the Defence Budget over the years 2011-2015 would be offset by a one per cent per annum growth thereafter. Meanwhile, SDSR 2010, so said the Coalition government, would ensure a secure Britain in an age of uncertainty yet in a more economic fashion. Odin wonders what can be expected under SDSR 2015 now that there is a fully-fledged Tory government and the world is a great deal more dangerous than it was five years ago. Only last autumn Prime Minster Cameron enthusiastically endorsed a two per cent of GDP figure devoted to UK Defence – not necessarily what Britain needs, mind you, but the minimum required by NATO. Recently, the Secretary of State for Defence has, in a bizarre twist, argued that some of the expenditure on ‘development’ (i.e. overseas aid spent by the Department for International Development) should be recategorised as ‘defence’ expenditure because it safeguards the UK by preventing wars. As we have noted in a previous Odin, it is hard to see how English classes for would-be footballers are a better investment of UK taxpayer’s money than more warships operated by highly trained British sailors. It is also a puzzle how soft power splurging of cash in Latin America or Africa will deal with the hard-nosed foes of the West who field tanks, submarines and strike jets. Outgoing Chairman of the House of Commons Defence Committee, Rory Stewart MP, in the spring summed up the state of our dangerous new world as follows: “It is vital to rethink the fundamental assumptions of our Defence planning, if we are to help arrest the descent into chaos, which threatens to spread from the Western Mediterranean to the Black Sea.” Instability has grown in recent months, including terrorist activity at sea off Egypt and Libya to Russia’s renewed determination to dominate the Arctic and Atlantic. The assumptions underlying Future Force 2020 are shaky. They were formed five years ago in a deceptively stable past that now seems like another country (to borrow a well known phrase). SDSR was devised prior to the rise of ISIL, before the collapse of Iraq, Syria, Yemen, Libya and the annexation of Crimea by Russia, which is also supporting an armed insurrection in Ukraine. Meanwhile, China and its neighbours are increasingly at loggerheads over various maritime issues, while North Korea pushes on with a sea-based nuclear missile capability and Argentina remains bellicose in the South Atlantic. Piracy shows signs of resurgence off East Africa and grows in the Gulf of Guinea, while the disease of terrorism spreads across Nigeria, Kenya and elsewhere in Africa, remaining deeply rooted in Somalia. So, by a change in accounting convention, the Defence budget has leapt by £2.4 billion and Britain, so the government trumpets, will achieve its two per cent of GDP target in defence spending. It has achieved the increase in defence spending by including things that are not, er, defence spending per se. There is apparently no need to invest in any additional equipment programmes or initiate extra recruitment. Yet the force levels are too small, the capabilities suffer gaps, and the personnel numbers remain depleted. In other words, the current UK government is not strengthening the UK Armed Forces in a time of increasingly dire threats to security. It is fiddling the books by including spending that does not contribute to the direct military effort. Elsewhere its ministers boast about the UK spending the most in Europe on defence as if being the best of a poor bunch was something to be proud of. They also highlight commitments of units to military and naval tasks that, while worthwhile, are subsidiary to the main job of defending the UK. In the minds of today’s government ministers delivering humanitarian aid or fighting disease counts as ‘defence’ when in reality it does nothing to deter potential enemies or prepare British forces for war. Any government that deliberately blurs the true meaning of defence, while mucking about with facts and figures to fudge NATO budget commitments, merely encourages trouble and disaster to come calling. 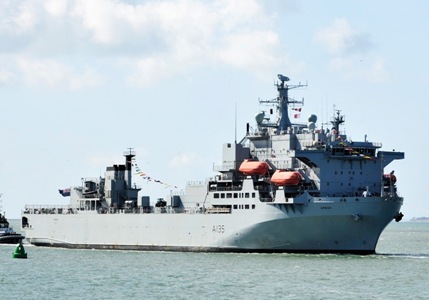 The Royal Fleet Auxiliary hospital ship RFA Argus back in UK waters after her deployment to fight Ebola in Sierra Leone. Type 23 frigates HMS St Albans and HMS Iron Duke (nearest) leaving Portsmouth in the summer of 2015.